Led by General Barriss Offee and Clone Commander Gree, the clone army is mounting an attack on the planet Geonosis. But it wont be easy. The Geonosians are expecting them and are firing back with their powerful Geonosian cannon with dual flick missiles! Includes 4 minifigures: Barriss Offee, clone commander Gree, Geonosian warrior and Geonosian zombie…. Led by General Barriss Offee and Clone Commander Gree, the clone army is mounting an attack on the planet Geonosis. But it won’t be easy. The Geonosians are expecting them and are firing back with their powerful Geonosian cannon with dual flick missiles! Includes 4 minifigures: Barriss Offee, clone commander Gree, Geonosian warrior and Geonosian zombie. 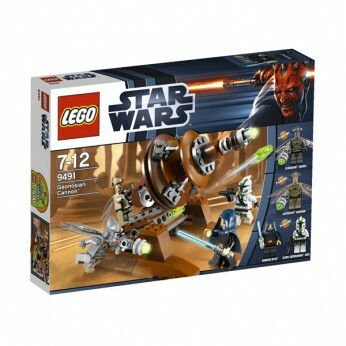 This toy costs approximately £19.99 (for the latest and best prices make sure you check our retailer list for the LEGO Star Wars Geonosian Cannon 9491 above). In our review of LEGO Star Wars Geonosian Cannon 9491 we classed it as being suitable for ages 6 years, 7 years, 8 years but recommend you check the manufacturer specific advice before purchasing.